On the highway, motorcycles are “small fry”. They’re easy for autos and trucks to miss or disregard. Over the last decade, there has been an increase in serious and sometimes fatal accidental injuries to motorcyclists. Consequently, responsible motorcyclists always stay alert to nearby vehicles and their surroundings. But that’s not enough if you want to take a safe ride. In many important ways, operating a motorcycle is not like driving an automobile. So you have to change your way of thinking and your way of driving when you ride your motorcycle. For example, to turn a motorcycle left or right, it’s not just a matter of turning a steering wheel. You must lean left or right depending on which way you want to go. Your motorcycle has two brakes, and you must learn to use them both and in coordination with each other. 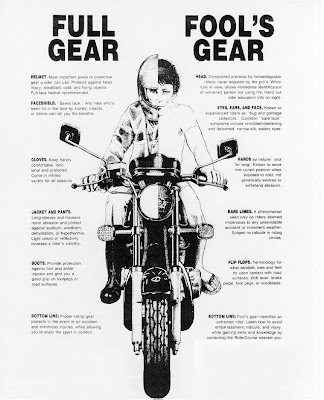 Unlike most automobiles which are equipped with automatic transmission, you will need to shift gears on a motorcycle. For this reason, going up or downhill can be particularly tricky. And these are just a few of the differences you need to learn. What are some of the basics in motorcycle safety? • Make it easy for automobile and truck drivers to see you. Wear bright colored clothing. Fluorescent, orange and/or yellow shirts, vests, jackets, and helmets enhance visibility during the day. At night, wear reflective material on helmets, vests/jackets, and even shoes. Remember, you must be seen from the side, not just the back and front. Put reflective material on the sides of your helmet, clothing and shoes, not just on the front and back. If a motorist can’t see you or your bike, he won’t take action to avoid you. Make it a habit to use your turn signals – always. Turn signals tell other drivers what you plan to do. They make your bike easier to see on the road. Nearby motor vehicle operators are more likely to notice your bike’s flashing turn signal than its activated taillight. Equally important, however, is the need to deactivate your turn signal as soon as you complete your turn or as soon as you decide not to turn after all. If your turn signal remains activated after you have made a turn, the driver behind you may assume you will turn again, and he may pull directly into your path. Enhance your visibility by tapping your foot brake lightly before you slow down, especially when you anticipate a quick stop. The flashing brake light will alert the driver behind you to your sudden change in speed. Stay out of blind spots. Motorcyclists are more at risk in a blind spot than other motorists because their cycles are relatively small compared to trucks and automobiles. Whenever you approach a vehicle you may want to pass, you must make a choice, and quickly too. Do you really want to pass? If so, pass as fast as you reasonably can. If not, drop back, well out of the blind spot. The less time you spend in another driver’s blind spot, the safer you will be. As you travel along the roads and highways behind another vehicle, take care to position your bike where the other driver will be able to see you in his rear view mirror. Keep in mind that intersections are always dangerous. It’s where most motorcycle crashes happen because auto or truck drivers who approach an intersection sometimes fail to see the motorcyclist who has the right of way as he travels down the main thoroughfare. • Keep your headlights on night and day. Sound strange? Yes, but studies show that keeping your headlights on high beam during daylight hours increases your visibility to oncoming traffic and prevents accidents. • Wear a Federal Motor Vehicle Safety Standard (FMVSS) No. 218- compliant helmet every time you ride your bike. It’s the law in many states so you may have no choice in the matter. Regardless, it is always safer to ride wearing a helmet that meets recognized Snell, ANSI, and/or Federal DOT standards. 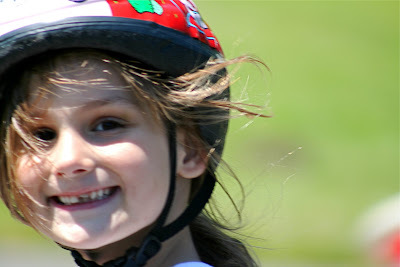 Statistics show helmets are 37% effective in preventing fatal injuries. What does this mean? For every 100 motorcyclists who die in motorcycle crashes, 37 of them would have been saved had they been wearing a helmet when the accident happened. And make certain your helmet is, in fact, a certified/compliant helmet. Watch out for helmets with false certifications or counterfeit stickers imprinted with a DOT symbol. Accidents happen close to home, not just far away. Never say to yourself, “Well, I’m just going a mile or two to the store or to a friend’s house, why should I bother with a helmet?” Helmets save lives. They give you some measure of protection against serious brain injuries in the event of an accident. In addition to helmet laws, there may be requirements in your state regarding face shields and safety glasses or goggles. Face shields protect your face from rain, dust, insects and flying debris. Goggles protect your eyes. Special regulations may control whether or not a motorcycle may carry a second passenger. This usually depends on whether your motorcycle is equipped with a permanent seat specially designed to carry a second person. A passenger who is not properly seated on a motorcycle is at increased risk of falling off a bike and accidental injury. • Follow state and local traffic laws. Motorcyclists must follow the same “rules of the road” and traffic regulations as automobiles and trucks. These laws may be even more important to the safety of the motorcycle operator than to drivers of other motor vehicles. 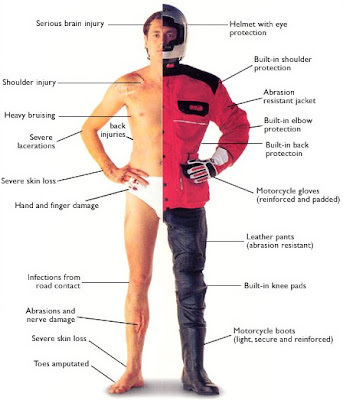 After all, motorcycles are not equipped with the same physical protections and restraints found in autos and trucks. Familiarize yourself with the general motor vehicle laws of your state. Just as important, study carefully the statutes directed specifically at the operation of motorcycles. They were enacted to help ensure your safety. 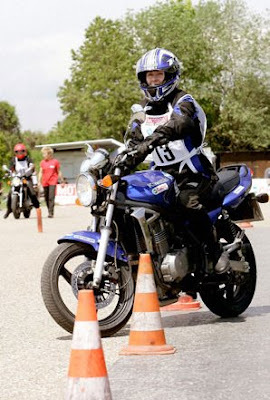 • Take a motorcycle rider skills training course. You can pay with your life if you don’t learn the essential skills necessary to operate a motorcycle properly and safely. Most everyone takes a driver training course to obtain an automobile driver’s license when they are teenagers. In fact, many states mandate such instruction because well trained automobile operators make for safer roads and highways. It makes just as much sense for motorcycle operators to take a skills training course given by a professional instructor and designed specifically for motorcycle operation. 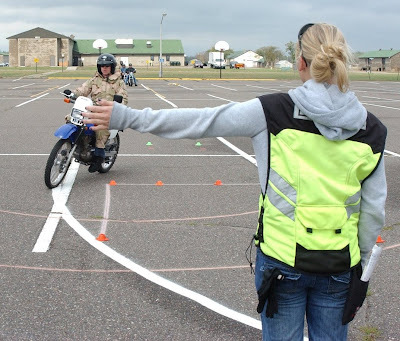 There are motorcycle rider skills training courses in most states. Your state department of motor vehicles, for one, should have information on such programs. And remember, there are skills training courses not just for the novice but for the more experienced rider as well. Take the time to refresh and refine your rider techniques by taking an advanced skills course every few years. • Obtain the driver’s license endorsement you need to legally operate a motorcycle in your state. Statistics kept by The National Highway Traffic Safety Administration (NHTSA) tell us that 25% of the motorcyclists who died as a result of traffic accidents in 2004 were either not licensed at all or were not properly licensed to operate a motorcycle. In 2004, 36% of all fatal motorcycle accidents were the result of speeding at the time of the accident. It’s simple. Speed kills. • Keep a safe distance behind other vehicles. Think you don’t have to maintain the same distance behind an auto or truck that an auto or truck must keep as it travels behind other vehicles? Wrong! A motorcycle ordinarily requires as much stopping distance as an automobile. Studies have shown that following too closely is a major cause of accidents on the part of the motorcyclist. • Don’t ride in an impaired condition. It is no surprise that alcohol and other drugs play a substantial role in too many motorcycle accidents. In 2004, for example, alcohol was involved in a much higher percentage of motorcycle accidents (31% higher) than auto accidents. And worse, according to NHSTA, 41 percent of the 1672 motorcyclists who died in single vehicle crashes in 2004 had blood alcohol levels above the legal minimum of .08 g/dL. Never ride while intoxicated. • Give your bike a “pre-trip” inspection. Long distance truckers give their tractor trailers daily pre-trip inspections and so should motorcycle operators. Check tire air pressure and the hydraulic fluid level. Look for signs of an oil or gas leak. Do headlights and taillights work in both high and low beam? Are your brake lights and turn signals operational? Do you need to refill your coolant reservoir? Clutch and throttle should work smoothly. Clean your mirrors and adjust them when needed. Engage your front and rear brake levers, one brake at a time, to ensure they are in working order. • Never ride someone else’s bike without first familiarizing yourself with its particular features and/or without giving it a pre-trip inspection. Don’t assume that someone else’s bike is just like yours. Make sure you know the location of the turn signals, the horn, the headlight switch, and the engine cut-off switch. Familiarize yourself with the controls and the bike’s gear pattern. Practice working the throttle, clutch and brakes a few times before you take a borrowed bike for a spin. • Beware of road surface and other hazards. Road surfaces that may not be so dangerous for auto and truck drivers may be very dangerous for the motorcyclist. Gravel roads, wet pavement, wet pavement with oil slicks, and paved roads with loose sand and gravel are especially treacherous. These surfaces provide poor traction for motorcycles traveling along them. Motorcyclists should think twice about taking their bikes out at all in mud, snow, or icy conditions. During Autumn, wet leaves can cause problematic conditions as well. Uneven surfaces can be dangerous. The motorcyclist should drive especially carefully when passing over bumps, broken pavement, potholes, railroad tracks, steel plates, grates, manhole covers or raised lane and highway marker to name just a few. • Remember that darkness reduces visibility on the road. If a motorcycle can sometimes travel unnoticed by traffic nearby in broad daylight, the situation at night is even more hazardous. Darkness reduces visibility. At night, it is more difficult for other drivers to see your relatively small motorcycle or to pick up its headlights and taillights from among the myriad of other vehicle lights surrounding you. It’s up to you to keep the odds on your side. Drive slower at night. Keep a greater distance between you and the vehicle directly ahead of you. Unless you are following immediately behind another vehicle or another vehicle is approaching you from the opposite direction, use your high beams. They will help you see unexpected obstacles or animals in the road in front of you. • Always remain alert to your surroundings and nearby vehicles. You can’t take action to avoid a potential accident if you are not aware of the danger. There are negligent motorists on the roads. They may drive recklessly so defensive driving is essential. What is one of the most deadly maneuvers a motorcyclist is likely to confront everyday on the road? It is the other driver who turns left in front of him while the cyclist is doing one of three things: (1) traveling straight, (2) passing the other vehicle, or (3) overtaking the other vehicle. In 2004, 39% of fatal motorcycle accidents occurred under one of the foregoing fact patterns. Do what it takes to ensure the other driver knows you are in his path if he decides to turn left in front of you. Following the suggestions outlined above will make for safer motorcycle operation. The stakes are high. And who has a greater interest in motorcycle safety than the motorcyclist himself? The cyclist who takes responsibility for ensuring he has taken every precaution to make his ride a safe one is less likely to find himself injured in a serious accident. Finally just remember, when you riding, wear the stuff, and ride with care. Be Hot Biker. Here is smith and I wanted to take this opportunity to share with you some exciting news that Safety Direct is the leading supplier of health, safety and hygiene products in Ireland with over two decades of experience in sourcing and providing quality, reliable products.have a look over this my friend. Wear bright colored clothing. Fluorescent, orange and/or yellow shirts, vests, jackets, and helmets enhance visibility during the day.